Discussion in 'Birds' started by Johnnymg, Apr 29, 2005. Holy cow........... Got these with a D70 and 85mm. These little guys are a real hoot when they race after the "lure". Next race it's "D2H time"
Interesting pic John. Are these just pets or are they 'pros' (like greyhounds)? JRT are some athletic little dogs and are full of energy. Good example of what I am talking about. Just "pets" ................. but some of the owners are pretty serious about the racing. We just picked up a JRT from a breeder who has a race-track on her property. She trains her dogs on a regular basis and takes this stuff pretty seriously. There are regional and national championships. The really serious (or crazy .........) folks run their dogs on a "lure" course which is more geared towards the bigger race breeds. 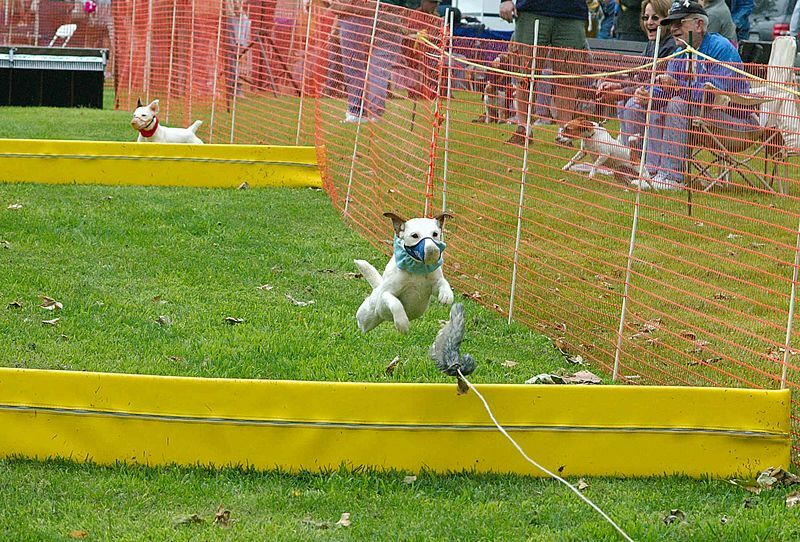 These JRT's are natural "racers" once they figure out what the goal is. I.e. get the flying tail. Cool shot. I bet they are quick little fellows!! The muzzles are used because these dogs can "go off" and attack each other. The spayed dogs aren'y too 'nutty' but the stud dogs will kill each other if given half a chance. It's sort of amazing to see them turn on each other ............ in a flash they will go at it each other like crazed hyina.